HomeAng ThongAng Thong & Ayutthaya Temple Tour: Amazing Buddha Statues and Steel Robots! Let's go see the Great Buddha of Thailand at Wat Muang Temple and the Reclining Buddha at Wat Khun Inthapramun Temple in Ang Thong! Have lunch and go see the steel robots. On the way back to Bangkok, we'll stop at Ayutthaya to visit Wat Phra Ngam! Let's start the trip by visiting the Great Buddha of Thailand at Wat Muang Temple in Ang Thong! It is the biggest statue in the whole of Thailand, the second-tallest statue in Southeast Asia, and the seventh-tallest in the world standing at 92 meters! Next, let's go visit the Reclining Buddha at Wat Khun Inthapramun Temple in Ang Thong! Marvel at the beautiful, giant structure! This is a great opportunity for some photo-taking! Let's have some Thai style lunch! Let's see the House of Steel Robots (Ban Hun Lek) in Ang Thong! This is a workshop known for making scrap metal art out of old automobile parts. How cool this is! Visit the Wat Phra Ngam Temple, where there is a restored temple ruin! There is also a walled monastic complex consisting of an ordination hall! The highlight here is the eastern entry gate covered in a Bodhi tree! The trip ends now! I will drop you at BTS Mo Chit Station. I hope you enjoyed my trip! 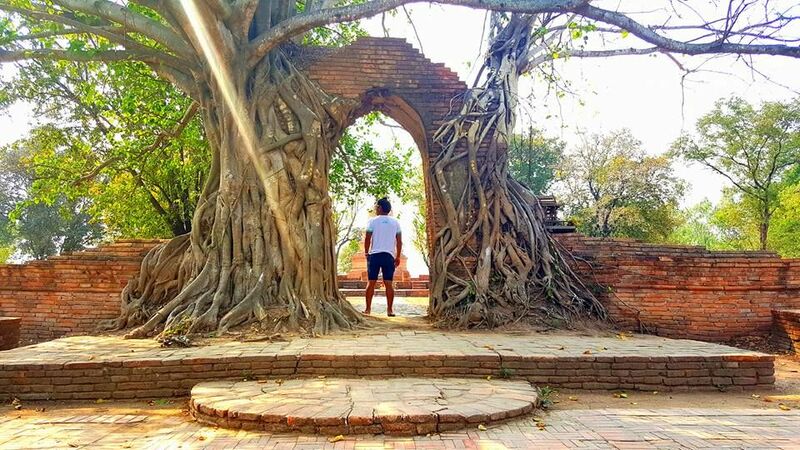 See the biggest Buddha and reclining Buddha then go to see the many steel models and stop by Ayutthaya to see the gate that is covered with a big tree. During we travel, we can see the view of rice farm.